Contrasts are not the least of those things in which Sicily abounds. 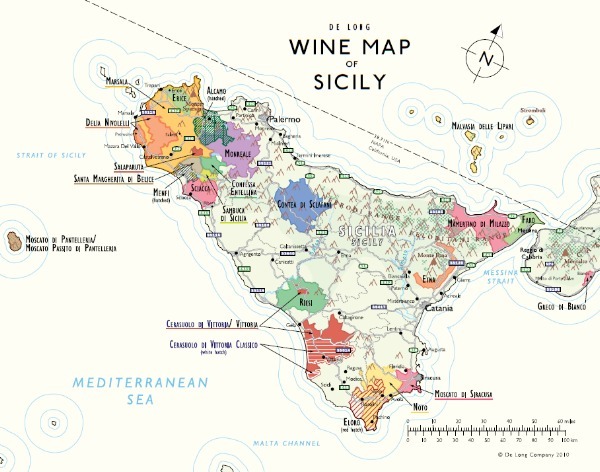 So perhaps it is not surprising that this ancient island boasts one of Italy’s most progressive wine industries or that a region noted chiefly in the past for strong and often sweet amber Marsala and Moscato has switched the emphasis toward lighter, fruitier wines mainly white but also red. Sicily, the largest island in the Mediterranean, has more vineyards than any other Italian region. Yet, with the emphasis shifting from quantity to quality, wine production has diminished recently to slightly less than that of Veneto. Sicily’s rising status among Italy’s wine producing regions is reflected in the recent promotion of Cerasuolo di Vittoria to DOCG; that pale but potent red from Nero d’Avola. Frappato is recognized as Cerasuolo di Vittoria Classico from around the town of Vittoria. Other wines from the surrounding area may become Vittoria DOC. Malvasia delle Lipari, from the volcanic Aeolian isles, is a dessert wine as exquisite as it is rare. The dry white and red wines of Etna, whose vines adorn the lower slopes of the volcano, show class. Production of the other traditional DOCs – the dry, red Faro and the sweet Moscatos of Noto and Siracusa – is small, but the volume of premium wine has increased somewhat with the addition of DOCs from various parts of the island. The greatest surge in volume of quality wine has come not with DOC/DOCG – which still represents only about 5 percent of total production – but with the rapid expansion of IGT, primarily under the regionwide Sicilia appellation. Many fine wines come from native varieties, notably Nero d’Avola (or Calabrese), Nerello Mascalese and Perricone (or Pignatello) among the reds and Inzolia and Grecanico among the whites. Also prominent are international varieties such as Chardonnay, Cabernet Sauvignon, Merlot and Syrah, which show real promise in Sicily whether as single varietals or in blends. A major share of the DOC is represented by Marsala, a wine originated by English merchant traders two centuries ago. Marsala remains Sicily’s proudest wine despite the not so distant era of degradation when it was used mainly for cooking or flavored with various syrups and sweeteners. Recently it has enjoyed a comeback among connoisseurs, who favor the dry Marsala Vergine and Superiore Riserva with the warmly complex flavors that rank them with the finest fortified wines of Europe. About 75 percent of Sicily’s wine is produced by cooperatives, but the number of privately owned estates has been growing. Prominent wine houses from northern and central Italy have invested in vineyards and cellars on the island. Methods of vine training in the sunny, temperate hills have been improved to reduce yields of grapes for wines of real character. Sicily, the largest of Italy’s 20 regions (25,710 square kilometers), ranks 4h in population (5,098,000). Sicily’s average annual wine production of 6,940,000 hectoliters (3rd among the regions) includes 5% DOC/DOCG. White wine accounts for 70% of Sicily’s production.